Despite the quality of the photo, the icing was duck blue and the stars silver and purple. One of my favourite things to do in anticipation of birthdays and special events is to plan the cake. I love baking, the flavour and filling are just as important as the decoration and I am always looking on Pinterest for inspiration and tips. Baking in the kitchen listening to my music is one of my happy times and my cakes are baked with lots of love. Mr S thinks it would be easier and cheaper to buy a shop bought version but that’s just not me, baking a cake for my family brings me real joy and satisfaction. It’s been birthday season in the Sparkles household so here are our birthday cakes for this year. Little Miss had a glitter ball cake. It was an orange and almond sponge with a white chocolate and orange filling, covered in a turquoise icing decorated with purple and silver stars. A simple but very effective design and delicious flavour. For Little Man, I made a football cake with a football figure, no 9 Harry Kane who was his world cup hero. His cake was a lemon and lime marble sponge topped with a green icing and white icing for football pitch markings. He loved it although I would have preferred something less plain as to me it did look like it was missing a little something. Whoops I forgot to get a good picture of the cake and most have my Little Man in blowing out his candles. This is part of the cake, imagine a football pitch with cut out icing letters spelling out his name and age. Whilst birthday season is now over, I’m already planning a Halloween cake with a spicy orange flavour and then a special design for Christmas. I think this has to be the year when I finally make a Christmas cake! This morning I have been busy in the kitchen preparing for Easter Sunday tomorrow. I love to potter in my kitchen and in here I feel my most relaxed, creative and happy. Apart from the functional use of the room, the kitchen is so important as Its where we eat as a family and share our day’s news. We use the table here for all our craft projects, playing board games and doing homework. Its where I sit in the mornings when the sun streams through the window and I read the paper or work on my computer. Its the room where I do my sewing and listen to the radio, or in the mornings entertain the children with my Mummy dancing as I make breakfast. It is my favourite room, the heart of our home. Today I have been in the kitchen baking for tomorrow. I love baking and a morning in the kitchen is my idea of bliss. 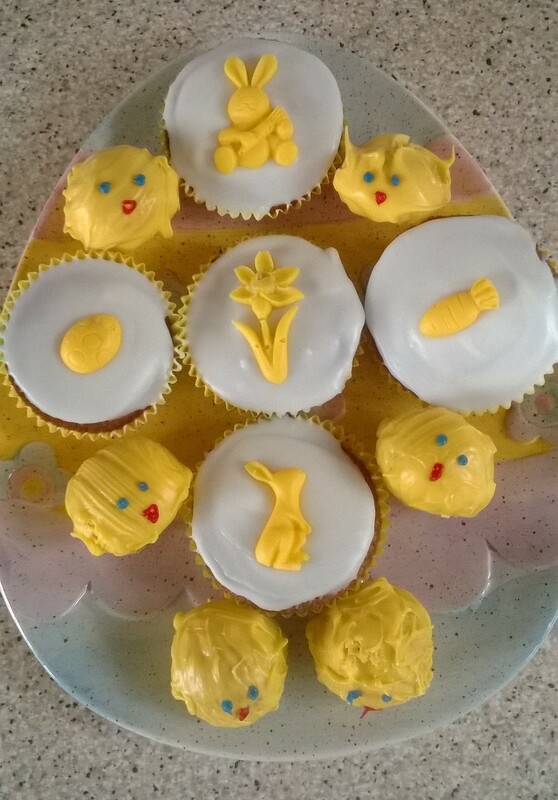 The recipes this morning were little chick cake pops and a few cup cakes topped with Easter decorations I made using a new mould. The mould was a recent purchase from Lakeland, one of my favourite shops full of inspirational ideas for the kitchen. This is the second time trying cake pops and I still quite haven’t mastered the art of the smooth chocolate around the cake, however I adapted my original idea and used a pastry brush to give a rougher texture to make them look fluffy! If I try these again I might look for an alternative to icing pens for the facial features, possibly small sweets etc. The moulds were excellent and if I make a Simnel cake next year may use these for some simple Easter marzipan decorations or make some fruit crème sweets for neighbours. Chocolate would work but there is so much chocolate everywhere its nice for a different sweet treat. 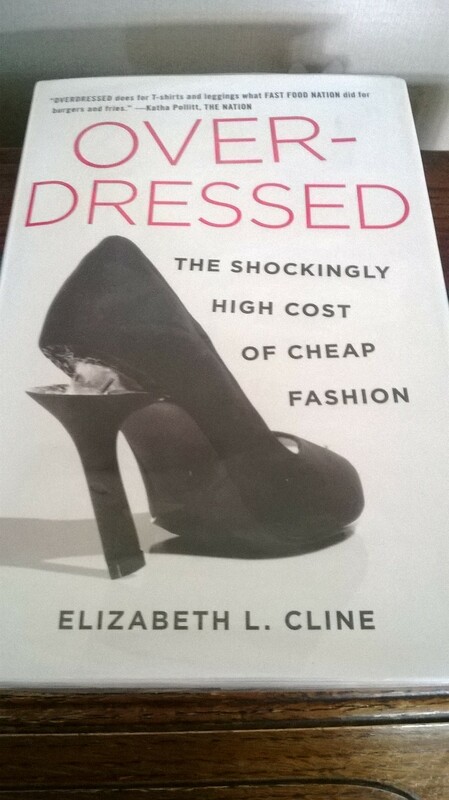 I recently read a recommendation for the above book ‘Over dressed’ by Elizabeth L. Cline and found it in my local library. It is an excellent read and one that reinforced my own thoughts about our consumer society. I do try and shop conscientiously, I do look for where an item has been made to ascertain the possible working conditions in which it has been produced and I will seek out items made in the UK. I’m delighted that our new kitchen units were all produced in the UK as was the new bedroom furniture we bought last year, with the recent economic difficulties we have to support our British businesses I have tried to be proactive on my stance, writing to my favourite shops for their policies on working practices and fair wages and commenting on their products. For example, I recently wrote to Cath Kidston a brand which sells itself as quintessentially English yet all its clothing was made in China. As much as I love their prints and products I cannot comfortably buy their clothes now, such a shame but I’m happy to live to my principles. This attitude to clothing means that I am making fewer purchases and my wardrobe is more streamlined. In a society which has become more throwaway and we only wear on average 20% of our wardrobes I like to think I am making more sensible choices. At times it can be difficult to buy goods I’m happy with, especially clothes and consequently I have become more interested in vintage for a variety of reasons, quality, materials, recycling etc.. I’m yet to find a hidden clothing gem but did find this beautiful, British made vintage clutch bag in mint condition in a charity shop for £3. 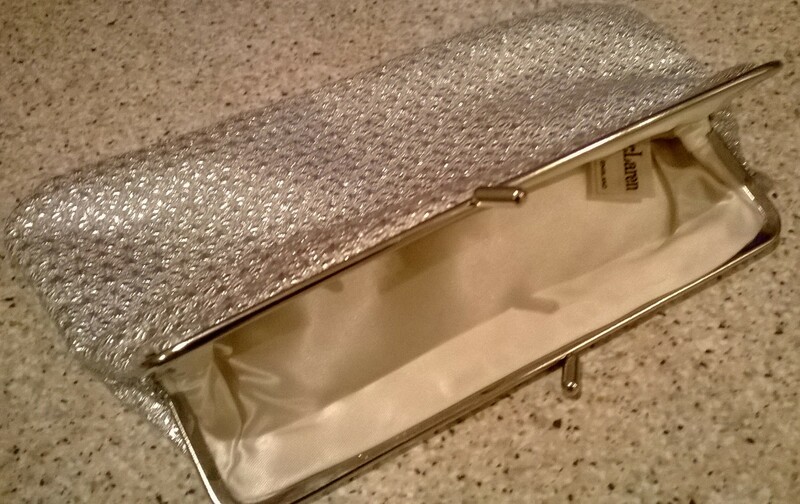 I used it for the first time at a Christmas party on Friday and it made me feel fabulous. I had gone for a 60s inspired look, fab eye make up, a black tunic embellished with a little sparkle and the fantastic bag. Next year my challenge is to include more vintage and hopefully start to make my own simple clothing. I made a skirt in Home Ec when I was 12, have I the same skills 30 years later? As tomorrow I’m planning on taking the children out for the day, today was the day to prepare for Halloween. We’ve decorated the kitchen, recycling old costumes as decorations, carved the pumpkin and done the baking for tomorrow’s themed lunch. Above in the photo is some of our baking. 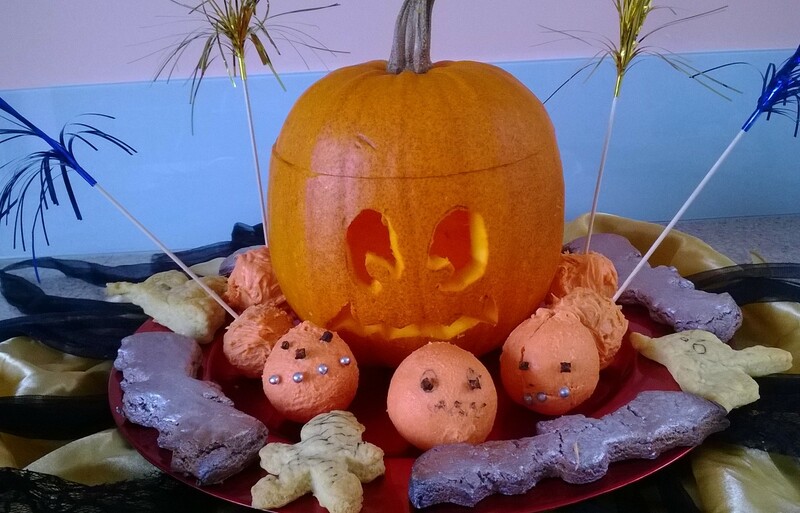 We’ve made orange flavoured pumpkin cake pops, covered in orange chocolate, bat biscuits sprayed with a silver sheen and ghost and mummy cheese biscuits. I’m proud to say that this is our work, the children were enthusiastic bakers and are becoming much more independent in their work, they were in charge of measuring, mixing and rolling the ingredients. The finished products may not be perfect but there is so much love,enthusiasm and work gone into making them. I really enjoyed making the cake pops this morning, my first attempt. The moulds are brilliant and the cakes were excellent. I found it more difficult with the coating as it was a specialist ingredient and I need a few more trials. However I have many ideas bubbling for Christmas baking using the pops. I had bought an edible ink pen, however this wasn’t as effective as I had hoped and whilst probably better on icing it did not work well on the cake pop coating or the cheese biscuits where I was trying to draw on bandages and facial features. I like to note down these reflections to remind me for the next time. In addition to the baked goods above, our lunch tomorrow will include a few more treats, sandwiches in the shape of ghosts, wrapped sausages in bread with tomato sauce as bloodied fingers and ghost bananas and pumpkin satsumas, I love a theme! This afternoon, I had one of my special baking sessions with Little Miss. I love baking and whilst my Mum was never a home baker, my Grandma instilled in me a love of baking. ‘Our’ recipe was cherry scones, but at her funeral I discovered that she had taught each of her grand daughters different recipes. I love that she did this so that her skills and special recipes live on in all of us. The other key baker in my childhood was my Godmother, Auntie Helen, Grandma’s youngest daughter, her marble cake was amazing and never bettered. Growing up, I was always the keen baker at home and my Dad an appreciative consumer, my favourite recipe was a fruit cake from an old black and white recipe book, the magic ingredient being a little melted chocolate. 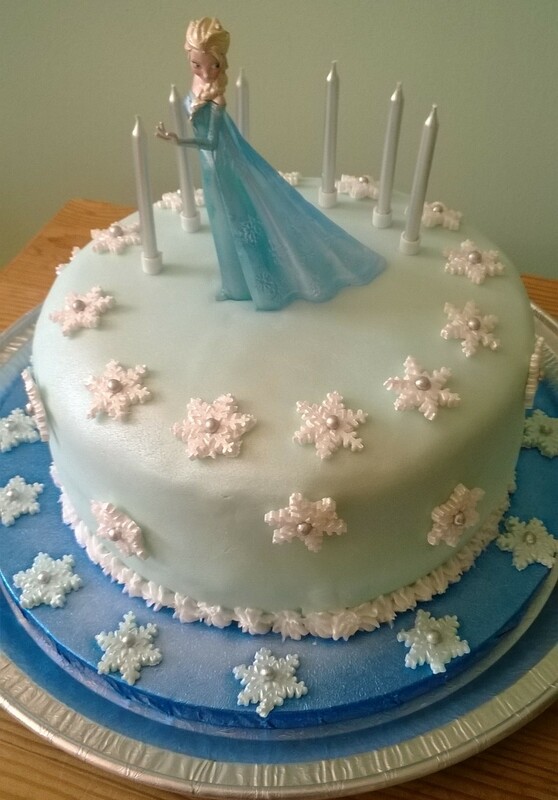 Being a mum has only developed my passion, I now have more keen tasters and exciting projects, I love a cake for all occasions and have a brilliant Pinterest cakes board for inspiration. I spend months planning for birthdays, this year we had a Spiderman cake and a Frozen themed cake. it did feel quite bizarre, making snowflakes on one of the hottest days of the year. 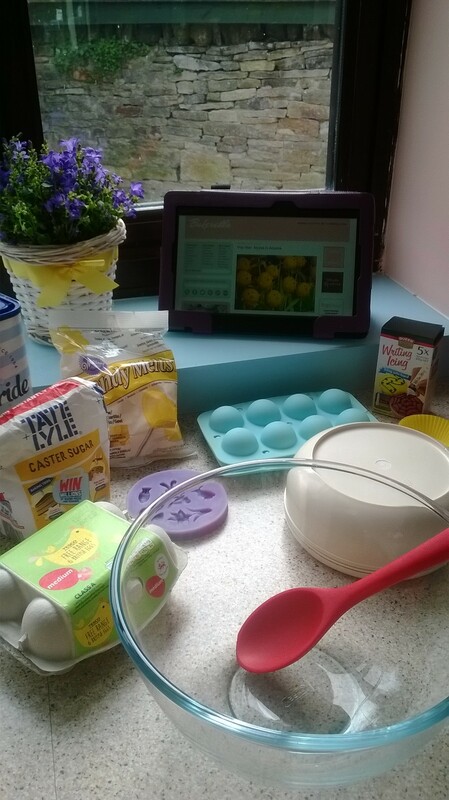 Today our recipe was for simple butterfly cakes. I want to keep baking easy and fun so Little Miss can learn the basics and enjoy the process. I am very careful that it is her work and relax with the presentation. 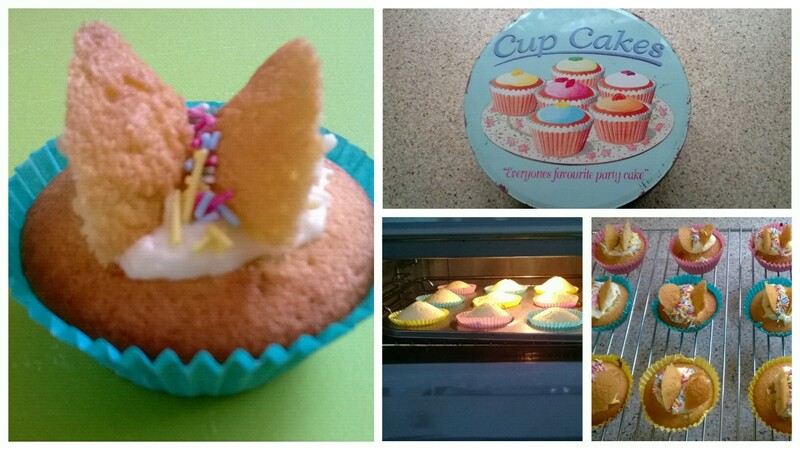 Little Miss had a lovely time baking this afternoon, perfect Mummy and daughter time and she was so proud of her cakes. She went up to bed tonight with one of my recipe books looking for our next project.